Gin is in! Boutique gins are all the rage and small artisan gin producers are springing up all over the place and there are several in the Westcountry. 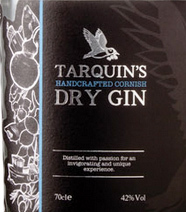 We are now selling Tarquin’s Cornish Gin, made in Cornwall with a twist of Devon violets! When Tarquin Leadbetter set up his own distillery, he was the first person to craft gin in Cornwall for more than a century. Tarquin is originally from Devon and, after living and working in London for a few years was very keen to get back to the Westcountry and start up his own business in the food and drink industry. Settling in Cornwall, he identified gin as a market with potential and spent the next 18 months distilling the spirit in a traditional copper still on his kitchen cooker. ”After a lot of work and research, I finally perfected my own recipe,” he says. “I use 11 botanicals in addition to the traditional juniper in my gin, resulting in a modern twist on a classic London Dry. The essential oils present in gin have also been used in herbal medicine for centuries. By looking at each botanical he uses – and its known effect – Tarquin has had fun drawing up a complete character profile of his gin. The gin is delicious. So, next time you fancy a G&T, think Tarquin’s. Cheers!